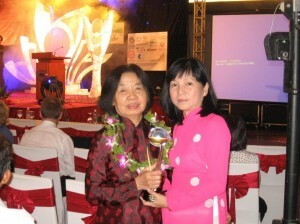 Under the DM in early March 2011, Agriculture Green Future (AGF), a non-profit organization devoted to promoting sustainable fertilizer, was founded on the research of the only female soil scientists in Vietnam: Phan Thi Cong (pictured). AGF promotes the manufacture and use of BioGro, a microbial bio-fertiliser invented in the 1990s by Professor Nguyen Thanh Hien (also pictured). AGF provides starter cultures and training in quality control to BioGro manufacturers, while promoting the BioGro brand. Phan Thi Cong, who continues to advance the BioGro technology, represents a younger generation positioned to carry this work forward. Hien, a highly skilled microbiologist trained in Moscow, Wageningen and Dundee, isolated friendly strains of microbes from the roots of rice plants near Hanoi. When rice roots are inoculated, these strains promote the growth of the plants with healthy roots, improving the availability of nutrients and resistance to disease. Her lasting desire has been to contribute to solutions that benefit poor farmers. Building on field research from 2000 showing the effectiveness of the bio-fertilizer technology, the results will now be published in several reputable journals. AGF is built on the DM project’s successful field trials in My Thanh Nam village in the flood zone of the Mekong Delta. Here, farmers have seen successful rice yields over four seasons grown with only 60% as much nitrogen fertilizer as normal farmer practice by using BioGro. The results mean farmers can reduce their costs because less fertilizer and chemical pesticides are needed. Poor farmers are rewarded with at least 10-15% more cash as gross margins in their pocket. “applying BioGro helps reduce chemical application and less pesticide use as well as less lodging of rice at ripening. Women household financial managers like more cash income, they are safer from pesticides from crop care, and they don’t have to hand-harvest rice because a harvester can be used. Over all, they’re happier and healthier“. Earlier, BioGro was applied at numerous places in northern Vietnam within the Red River Delta, the central highlands near Pleiku and the coast near Da Nang in Quang Nam Province. To date, it has demonstrated benefits all over Vietnam. Now in the Duc Hue district in Long An province, AGF has formed partnership with Mrs. Kieu who will manufacture BioGro. 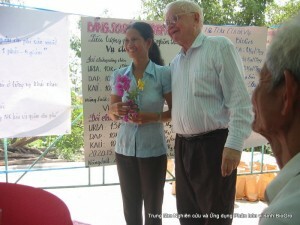 Mrs. Kieu contracted with 30 local farmers to use BioGro in their rice production. AGF will provide Mrs. Kieu’s Duc Hue factory with equipment needed to manufacture BioGro while assuring its quality. AGF is now planning a large expansion of production from 2011 to 2013. Much depends on farmers accepting this new technology, but AGF anticipates signing contracts with at least three BioGro manufacturers in the next two years. With plans for expansion in place, the stage has been set for many of Vietnam’s rice farmers to benefit from this environmentally-friendly technology. 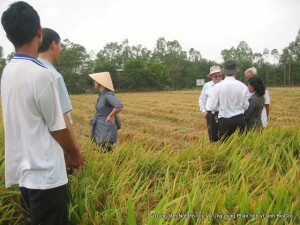 And women at every stage will have led the way to Agriculture’s Green Future in Vietnam.